On January 1, no one would have predicted protesters in Tahrir Square would oust Hosni Mubarak and Moammar Gadhafi’s iron grip over Libya would start slipping away. Could an Israeli-Palestinian peace agreement be the next game-changing event in the Middle East? According to Professor Yoram Peri of the University of Maryland and former Democratic Congressman Robert Wexler, the revolutionary fervor sweeping the Middle East could present an ideal opportunity to finally settle the Israeli-Palestinian conflict. Peri said that, although the uprisings in Arab world focused on domestic issues, it is only a matter of time before the lingering Israeli-Palestinian conflict becomes the focus of the greater Arab world. 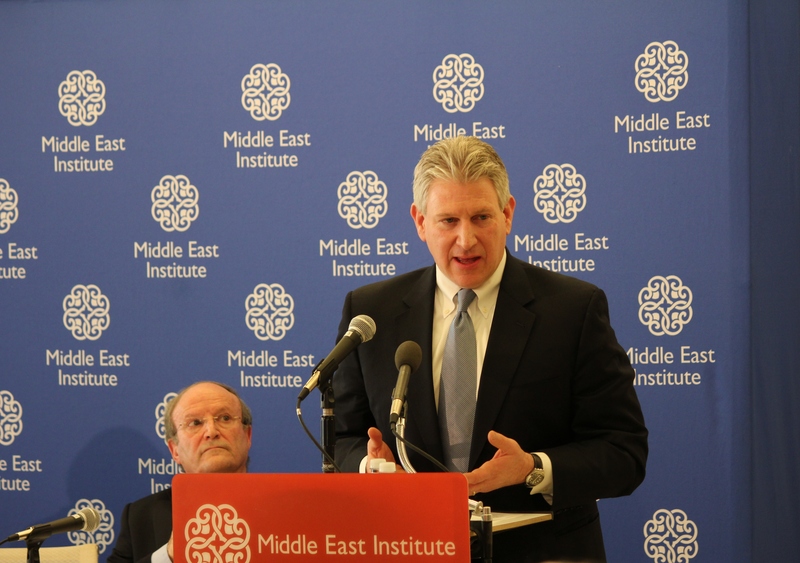 “If things will continue it won’t take much—weeks—that the Israeli-Palestinian issue will become the focus,” Peri said at a forum sponsored by the Middle East Institute Wednesday. But the recent re-emergence of negative Arab stereotypes in the Israeli media and the infusion of religious emotion into the context of the conflict will prevent Israel from pouncing on the opportunity. He added that in the wake of the Arab uprisings, Israel has crafted its Palestinian peace strategy around a worst-case scenario instead of mounting a serious attempt at peace. “That’s a very typical way of thinking by most Israelis when they look at their future,” Peri said. He said it is unlikely the government will take “a very brave step” desired by more liberal Israelis because of the increasingly conservative tint of the Israeli ruling coalition and a potential election looming. Wexler echoed Peri and said that, although the stage seems set for finally resolving the conflict, it will most likely not happen if the world relies on Israeli and Palestinian leadership to take the initiative. Both at the forum and in a recent editorial in Politico, Wexler stressed the United States must intervene as quickly as possible to end the conflict. He predicted that if diplomats continue to wait for the crisis to resolve itself, “some catastrophic event will occur” in the West Bank or Gaza that could thrust Israel and the Palestinians into another conflict. He said he is not confident Netanyahu or Palestinian Prime Minister Mahmoud Abbas will lead a diplomatic charge. Wexler said the recent events in the Middle East have made it the best time to rekindle peace talks. He called on the Obama administration to partner with Great Britain, Germany, France and other European countries to mediate talks between the two sides. Peri agreed with Wexler’s call for international intervention. He said Israelis and Palestinians’ perception of the conflict as a zero-sum negotiation has prevented substantial progress from being made in the past. He said American intervention helped propel the 1979 Egypt-Israel peace treaty because both sides were promised generous American military and economic aid. “A third partner, and it only can be the United States and not Europe, can change the structure of the conflict to a non-zero-sum game. And therefore without…American support it will not be achieved,” Peri said. The continued idleness of Israeli and Palestinian negotiators will escalate the costs of the conflict. Both sides know what the basic outlines of a peace treaty will look like and need to muster the political will to strike a deal. It be right to speculate that this is the opportune time to try and bring about a compromise between the Israelis and the Palestinians. However I think that they both feel that they have an inalienable right to certain territories. I’m not sure if the protests that we’ve seen so far is enough to change that. There is one nation in the Middle East that is not roiling in anarchy, rioting, and internal warfare. It does so without oppressing its citizens. It encourages and protects the practice of all religions. That nation is Israel. I’d agree Gabe, most democracy scholars who study the middle east dispute everything, but agree that the Israeli-Palestinian conflict needs to be solved for democracy to really stick in the Arab world. I don’t think it’s gonna happen anytime soon, but in the next 10 years, I think we’ll see significant progress in solving the dispute.